The digitization of business functions is not a new phenomenon, particularly in developed economies. However, the adoption of technology for HR and payroll processes in developing countries such as China is far less common. Arguably, it is in these countries where such IT solutions are the most needed, and could have the greatest transformative effect on business operations. Although China is rapidly developing into a mature economy, the HR and payroll processes of many companies operating in the country are still paper-based or recorded on rudimentary Excel spreadsheets. The digitization of business functions is not a new phenomenon, particularly in developed economies. However, the adoption of technology for HR and payroll processes in developing countries such as China is far less common. Arguably, it is in these countries where such IT solutions are the most needed, and could have the greatest transformative effect on business operations. Although China is rapidly developing into a mature economy, the HR and payroll processes of many companies operating in the country are still paper-based or recorded on rudimentary Excel spreadsheets. This leads to inefficient use of time by HR professionals, and makes record-keeping a challenge. Such HR and payroll processes also have low levels of transparency, which often hurts overseas managers who are unfamiliar with the Chinese language and unable to physically access relevant documents. IT solutions are a popular way to manage these challenges in developed countries, but foreign companies should consider local conditions in China as well as their company’s structure and needs before implementing a similar system in China. Some IT solutions have a very specific and targeted purpose, while others are comprehensive and wide-ranging, affecting virtually all business functions. Ultimately, the optimal solution rests on a company’s current requirements combined with its long-term growth strategy. As the name suggests, single function software has one core use. These solutions are conceptually straightforward, but come in a variety of forms and can have dramatic effects on efficiency and productivity. Time and attendance software products include biometric scanners and mobile phone apps that employees use to clock in and out of work. Though simple, in China they come in a variety of different forms to suit different businesses, such as a physical input that also acts as an office key, to digital clocks accessible from any location that track the time spent working on a given project. These types of software allow employers to objectively determine when employees arrive at and leave the workplace, thereby preventing false overtime claims and increasing office security. They also slash the amount of time HR staff spends calculating employees’ work hours and reduce the potential for incomplete or inaccurate documentation, thus allowing for simple payroll processing. Further, managers can analyze the data collected by HR and payroll software to make more informed business decisions. For example, project work hours can be objectively tracked, and then compared with the average time spent working on similar projects or projects undertaken by different teams. This information can be used to measure productivity and determine if profit margins on a given project are accurate and valuable. Tax processing software is another type of single function software that can make HR administration and payroll processes more efficient, but in a far different way. Where the value-add for solutions such as time and attendance software is on the collection of information, tax processing software creates value in the computation of inputted data. Collecting the relevant input data and accurately calculating the correct tax payments is a significant challenge in and of itself. This challenge is compounded when HR and payroll duties are handled by those unfamiliar with China’s complicated tax regime, such as by payroll processors located in a foreign company’s home country. Single function software such as tax processing programs can thus be a solution both for small and medium sized enterprises that lack the requisite internal resources, and for larger companies that need assistance with China’s particular compliance demands. Large multinationals invest heavily to establish in-house IT and ERP solutions to handle their complex operations, while smaller companies often enlist a third party provider for HR and payroll functions. Medium sized companies often find themselves somewhere in between. These organizations are growing large enough that outsourcing HR and payroll is no longer economical, but cannot afford to set up, configure, and maintain an ERP system from large tech companies like SAP and Oracle. 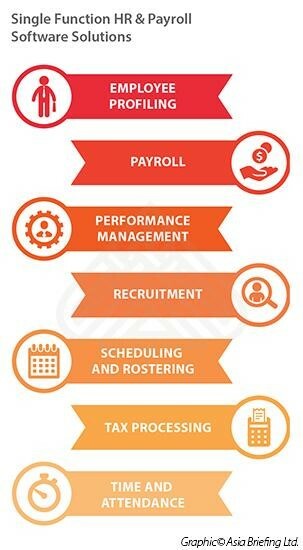 For companies in a position such as this, the solution is increasingly an ERP-based solution set up by a payroll provider familiar with China’s payroll landscape. Individual profiles can be set up for each employee, containing their contractual details, bank information, and social insurance obligations, etc. These can be configured with organizational HR hierarchies: reporting lines between employees and managers, and different teams and departments. For example, an employee can scan the fapiao (invoice) for a taxi trip, and upload it to his or her profile to apply for a work-related expense reimbursement. The relevant manager will then be automatically notified of this claim by e-mail, and can approve or reject the expense accordingly. If approved, the expense will be transmitted to HR and payroll staff, and added to that employee’s monthly salary payment. Such a process cuts down on physical documents, streamlines record keeping, and increases efficiency. It also promotes more formalized HR and payroll processes, and allows for greater transparency. An executive, for instance, can easily compare how internal policies are being followed across different teams, and make sure that no single team or individual is getting preferential treatment at the expense of another. This functionality is especially beneficial in China, where managers are not often based in a single location permanently and must travel between offices and factories, overseeing several operations remotely. As more and more companies adopt China Plus One strategies and open complementary operations in other Asian countries, the ability to streamline and formalize HR and payroll processes through digital systems becomes increasingly important. Before choosing an IT solution, a company must define its needs and what it hopes to achieve in terms of business processes. Some companies may be looking to bridge an organizational weakness, while others may be seeking to formalize and strengthen existing processes. This is the difference between simply ensuring that employees are paid the right amount and on time – a challenging task in its own right – and strengthening internal controls regarding payroll processes. IT solutions can bridge efficiency and accuracy gaps in the payroll data gathering and transferring process, and streamline related business processes. 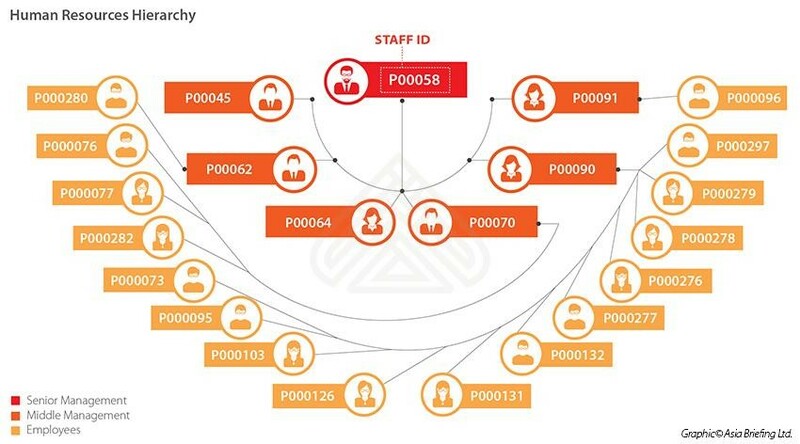 While they facilitate the collection and computation of inputs, knowledge of China’s payroll regulations is still required to make accurate payments and maintain compliance. A comprehensive HR audit should be undertaken before an IT solution is adopted, as simply digitizing weak internal processes will translate into a weak digital system. Further, implementing a solution before needs are expressly defined will inevitably lead to unforeseen and unpalatable cost overruns when systems need to be reconfigured to suit processes that have been changed from the ground-up or redesigned to correct unanticipated and unwanted outcomes.